This week, Donate Life America (DLA) and the Donate Life State donor registries are recognizing the extraordinary efforts and commitment of the Driver License Divisions of the country’s Departments of Public Safety and Motor Vehicles for their steadfast support of organ, eye and tissue donor registration. 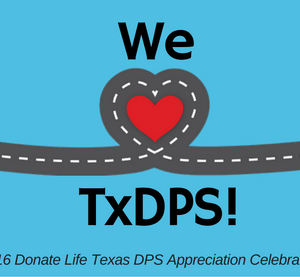 September 19-23 has been designated as National Donate Life DPS / DMV Appreciation Week. However, in true Lone Star style, the Texas state observance is bigger and spans the entire month of September. These nine words may not seem like a big deal. But, to a person waiting for a transplant, they can be the difference between life and death. Since the creation of the Donate Life Texas registry, 962 donors registered through Donate Life Texas have made 3,278 organs available for transplant patients. In addition, thousands of people have been touched by the equally precious gifts of registered cornea and tissue donors. That means that hundreds of families are grieving a terrible loss but can be comforted knowing their loved one’s final, heroic act gave others a second chance through donation. Those precious gifts directly touched the lives of tens of thousands of people as well as their families and loved ones for generations to come. Donation is about life. Whether the gift is organs, corneas or tissue, it’s about all the possibilities a second chance can bring. And, in an ever-growing number of cases, it’s journey that begins with a conversation that started right here, with nine powerful words at a Texas Department of Public Safety’s Driver License office. On behalf of Texas donor families, organ transplant recipients, those who have been given the gift of sight and those healed by tissue donations, Donate Life Texas and our team of organ, eye and procurement organizations are proud to announce the first-ever National Donate Life DPS Appreciation Celebration in honor of the people whose daily efforts play such a vital role in making lifesaving transplants possible. Learn more about the National Donate Life DPS / DMV Appreciation Campaign through Donate Life America.